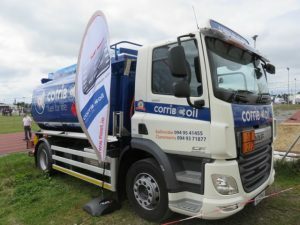 Road transport operators and drivers, together with commercial vehicle dealers and trade suppliers from all over the West gathered in Claremorris, County Mayo at the weekend for a most successful inaugural Connacht Truck Show 2018. With the Summer sunshine returning for the August Holiday weekend, a vast crowd attended the first ever Connacht Truck Show, which was an added attraction to the 100th Claremorris Agricultural Show 2018 programme. Co-sponsored by Capitalflow Finance and Western Truck & Trailer Parts, leading names in the road haulage business came to Claremorris, the town known as the ‘Heart of the West’ as it is centrally located in the province. According to expert estimates, there was around €10 million’s worth of high horse-powered machinery on exhibit at the Old Racecourse Showgrounds. All static display truck entrants were in contention for the Top Truck of the Show Award, with the winner, chosen by Show visitors, receiving the Paddy Kelly Memorial Cup. 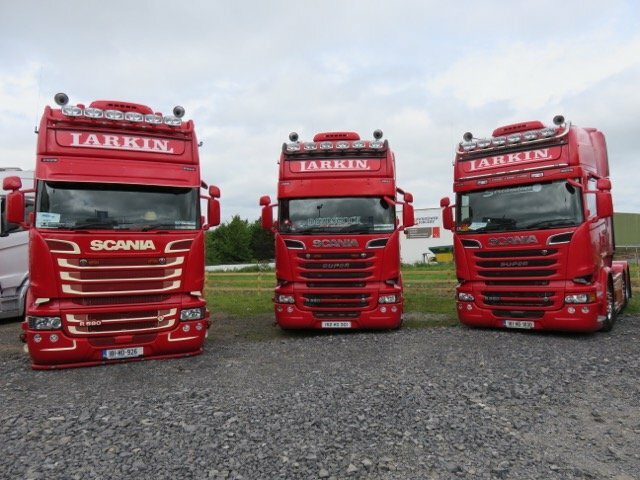 Larkin Transport’s new Scania R580 6×2 proved to be the most popular choice. Pete Kelly, brother of the late Paddy, presented the cup to a delighted Danny Larkin, from the local family run haulage company. The winner of the Visitors’ Choice competition in choosing the most popular truck at the Show was Alec Legg, a young truck enthusiast from Dublin. 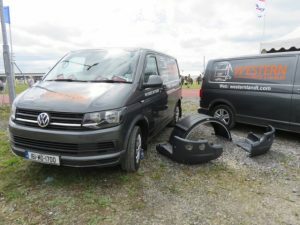 “Feedback from the truck exhibitors was extremely positive, all expressing satisfaction at being able to attend a major show of its type at a location ‘this side of the Shannon’. The event also provided a sense of appreciation from the general public on the huge investment made by the road transport fraternity in purchasing these high-tech trucks, that are well maintained in order to carry out their vital service to business and customers,” commented Jarlath Sweeney, Fleet Transport on behalf of the Connacht Truck Show organisers. “The great variety of trucks of all shapes, sizes and colours, many with striking livery and artwork definitely added to this special 100th edition of the annual Claremorris Show. There’s no doubt that the record attendance enjoyed the new attraction and be in a position to see and photograph these trucks up close and talk with the drivers. The trade element had representations from truck dealers, commercial finance providers, spare parts and component suppliers as well as merchandise sellers. Business was reported to be brisk, which was another positive from the event, first time around,” stated Gerry Lynch, Chairman 100th Claremorris Show Committee. “Special thanks to all of the transport companies and drivers, the businesses exhibiting for their support, and to the Claremorris Colts Rugby Club members for their help with traffic control and truck parking. We also appreciate the excellent press coverage from the regional media. It was a wonderful spectacle,” added Jarlath.